What Day Of The Week Is December 1? 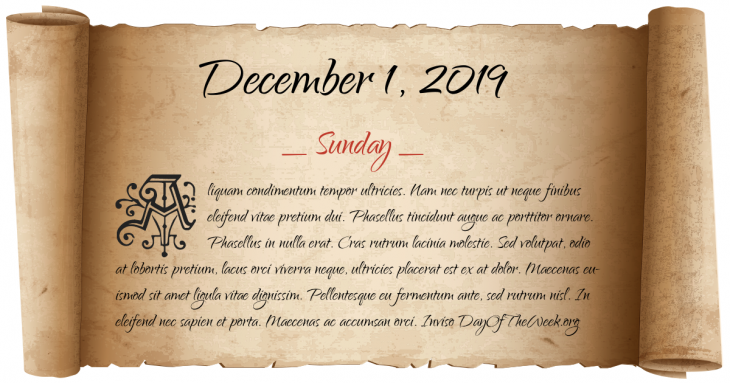 December 1, 2019 is the 335th day of the year 2019 in the Gregorian calendar. There are 30 days remaining until the end of the year. The day of the week is Sunday. First serving of the soft drink Dr Pepper at a drug store in Waco, Texas (United States). The New York Daily News reports the news of Christine Jorgenson, the first notable case of sexual reassignment surgery. Northwest Orient Airlines Flight 6231, crashes northwest of John F. Kennedy International Airport. Lambda Theta Phi - The first Latino fraternity is established in New Jersey. Who were born on December 1?